Lync Location Policies are used to specify how to deal with emergency calls originating from Lync clients. Quite a bit has been written about location policies and how they are used in E911 emergency dialing scenarios (for a few examples, see Technet or Mark King's UnplugthePBX blog). Unfortunately, E911 only exists in the US, so anybody reading the documentation outside the US might conclude that location policies aren't required, and that emergency calls can be routed as other normal calls. While this is technically true, location policies still provide some critically important functions in specific scenarios that may not be apparent until you have to deal with them firsthand. Your company has a single site spread across several floors of a building and everyone is assigned an extension, instead of a full directly-dialable phone number (DID). Your company has a single main office external phone number which rings to reception. Your company uses a centralized SIP trunk for normal calls, but all remote sites are configured with small PSTN gateways used to provide Lync-based local emergency dialing via a few analog lines. Each user have their own dedicated directly-dialable phone number. Users are assigned to a voice policy that ensures that emergency calls will route out the local PSTN gateway. For scenario #1, if someone within the office calls the emergency service applicable for their country (lets use 112, a common emergency number in Europe and many parts of the world), the number that will be presented to emergency services will be your main office number. For scenario #2, if someone from a remote office calls 112, the phone number that will be presented to emergency services will be that of the analog line assigned to the PSTN gateway. The user who called 112 accidentally hangs up because that zombie finally caught up to him. What happens next (other than you now have two zombies)? We'll call it the "Hang-up of Death". What happens when someone travels from their usual office to another and has to call emergency services because of....yeah, zombies? It's the "Travelling Salesman of Doom". For #1, the typical response from emergency services is to re-dial the number that will show up on their console. In the single office/extension scenario, they will reach reception who may have no idea about who called 112, which can waste valuable time, depending on how fast the zombie horde grows. In the remote site scenario with a dedicated analog phone line, emergency services would redial the analog number, and the call would ring endlessly, since its not likely that anybody considered someone calling inbound to an emergency number. Or if someone was bright enough to forward incoming calls to reception, they still might not have any idea on who called 112 in the first place, again wasting valuable zombie killing time. For the unfortunate travelling user in #2, remember that unless you've implemented location-based routing, the user's calling behaviour won't change based on their current location. If they call 112, then the call will route out the user's normal PSTN gateway which means emergency services will show up in their normal office, while our poor guy gets chased down by zombies. If location-based routing has been implemented, then we still have to deal with the fact that reception at the local site still has no idea where the zombie attack is taking place. As you hopefully have discerned, location policies can help with both of these situations very well. Firstly, location polices can be configured to notify one or more users by IM that someone's called emergency services. This way, when emergency services shows up, or if they have to call back, reception or security or whoever will have a bit more information about the situation than they would otherwise. Secondly, location policies can be assigned to Lync network sites, which means that emergency calls will go out the proper gateway no matter where the user is typically situated. This works very similarly to location-based routing, except that it's only for emergency calls. 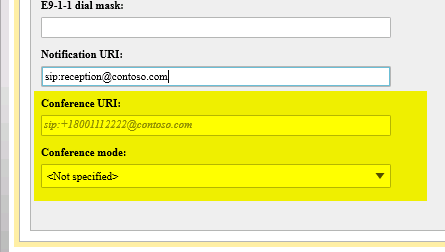 Configure Lync network sites and subnets for everywhere that Lync users could go. Configure location policies and assign them to each Lync network site, and set it to use the local PSTN gateway for emergency calls. Check the box marked "Enable Enhanced 9-1-1 (E9-1-1)" even if you don't use E911. This seems to be a prerequisite for emergency dialing via Location Policies to work at all, despite what Technet says. Assign the appropriate default location policy to every user, to act as a fallback in case they are outside a Lync-defined subnet. Configure the notification URI field* in the location policy so that the appropriate people are aware whenever the configured emergency number is dialed. If using analog gateways for emergency dialing only, make sure that inbound calls route to the appropriate person, should emergency services need to call back (ideally the same person who's been assigned to the notification URI field). Consider populating the location information services (LIS) database even if outside the US, because this can help reception figure out where the person who called emergency services is located. * A special note about the the Conferencing URI fields: You probably noticed these fields, which implies you can conference someone in when they dial the emergency number. Unfortunately, this doesn't work unless you're actually using an E911 provider in the US. If you're outside the US, you can enter values here to your heart's content, but it won't do anything. Boo-urns! Thanks to C. Anthony Caragol (check out his LyncFix blog) for bringing this annoying little tidbit to my attention. For detailed instructions on how to configure Lync network sites and location policies for non-US locations, I strongly recommend Elan Shudnow's blog post on the subject.